With God’s help I pray to God that He bestow upon me His wisdom and His knowledge and that I should be worthy of conveying this to this worthy gathering and the message should go out to the world, the truth of God, the truth of the Torah, amen. I was in turmoil about what to talk about; we had many different thoughts on this issue of the holocaust. When you speak about the “holocaust” you are not talking about a single time or a single event. Rather you’re talking about the concept that touches upon nations, that touches upon religions, that touches upon humanity; It touches on the whole world configuration and therefore, in a time limit of fifteen minutes, of course, it is really impossible to convey the views and the feelings and all the issues that abound with this issue of holocaust. But as I started, I humbly pray to God, that He should bestow upon me His words, I hope to be the good messenger to be able to convey the points that could be an opening, an eye-opener for the beginning of the question, the return, the reevaluation of the holocaust; it should be a time that we should be able to know from where to start to think about what the holocaust was all about. Firstly, when the word “holocaust” is used, it is used in regard to the Jewish people... I should start of course, by thanking the Islamic Republic of Iran, the Honorable President Achmadinejad, and all the people involved here; the Foreign Ministry and others who have put together this conference, allowing the talks of the holocaust to come about. So I really thank them and God should give them all, strength and courage that they should be able to do God’s will and in the future that we should be able to have invigorating and open talks about what is in our hearts. The issue of the holocaust, if we wouldn’t talk about it, would remain embedded in the people’s hearts with very bitter feelings [against the Jewish nation], as they are untill today. You find many people who are very embittered against Jewish people and they feel that the holocaust is being used as an excuse to perpetrate a terrible crime against a portion of humanity, at least. The main people who are suffering anew from the holocaust today, would be the Palestinian people. And therefore this is something which has had representation here, by the Muslim people. But there are other people also who feel that they are being harmed by the issue of the holocaust. Of course the Jewish people throughout the world will tell you that it is an open wound and it hasn’t gone away and that they are still suffering from repercussions of the holocaust. But many people say that we can’t talk about this subject. And therefore the feelings and the notions of people about what is wrong, what is right, what happened, and who was responsible and so forth remains their opinions and they walk around their whole life hating each other and eventually it can explode and terrible crimes could come about because of this. So therefore this is so important to open this discussion and in the future let us hope that we should come to a clarification of all of this. The holocaust is something which is, I believe, (and I’ve heard many speakers here say) is something which is very hard to say that the Jewish people did not suffer. I mean somebody has to be, I think, either very very embittered or a person who doesn’t want to open his mind to study, to say that the Jewish people weren’t exterminated. The fact is that there were millions and millions of Jewish people living in Europe before World War II. Poland, the statistics say around 3 million, and Hungary there was over half a million, maybe close to a million and you go through Slovakia, Czechoslovakia, Rumania and Ukraine, they were all full of Jewish people, full of Jewish communities and today they don’t exist. And almost nobody tries to refute that. It would be ridiculous to refute it because the fact is, the Jewish people were there and now they are not there. Now maybe I can say that at the discussion of the holocaust, I may be the representative, the voice of the people who died in the holocaust because my grandparents died there. They were killed in Auschwitz. My parents were from Hungary. My father escaped and his parents remained. He wasn’t able to get them out of Hungary and they died in Auschwitz as were other relatives and all the communities that they knew. So to say that they didn’t die, to me you can not say that. I am the living remnant of the people who died in the holocaust and I am here, I believe sent by God, to humbly say, simply to speak to the people here and say, “you should know that the Jewish people died, and do not try to say that it did not happen. They did die.” There are people throughout the Jewish communities, still alive in their seventies and eighties and every one of them will tell you their stories. It is something which you can not refute, but that being said, it doesn’t mean that the holocaust is a tool to use to oppress other people. And that is the most new unfortunate piece of the holocaust, why the holocaust is such a bad word, because the holocaust is being used today to oppress another people. But mind you, it is not being used by the Jewish nation. The holocaust is being manipulated and abused by a movement that refers to themselves as the Jewish nation, that usurped the name of the Jewish nation. The Jewish nation after World War II was very weak and the people who were in power, who were non-religious, people who were far from God who decided for convenience sake that they wanted to use the word “Judaism”, they wanted to use the Star of David, they wanted to use the Bible to be able to gain a materialistic gain: the state of “Israel”. They decided that they are going to use the holocaust to be able to reach their goal of having a nation. How does this work? We really are going to have to digress and speak just a little about the concepts of Judaism and Zionism because otherwise it does not really make sense, this whole discussion. We don’t understand the ways of God, we don’t understand a tsunami; we don’t understand when God gives a decree on a people. But we know one thing: God is compassionate. And we know one thing, that we never in our history would change one letter of the Torah. We would never do anything because it is our will, only what the Torah says. When God commanded us to go into the land, it was because it was God’s will, one reason being because the Canaanites served idol worshipry, they defiled the land. They were offered the choice to stop serving idol worshipry. If not, it was God’s command, they must leave or they were killed. God’s command had nothing to do with the will of the Jewish people. The Jewish people went into the land of Canaan and God stipulated, that if they did not maintain a high level of holiness, they would be sent out of the land and they were eventually sent out. The Jews accepted this punishment, as it says in the words of the prophets, I know that the Muslim people accept the words of the prophets, as they know they are the words of God. It says in the words of the prophets that the Jewish people were sent out of the land because they were not on this level of holiness. God clearly stated “do not return en masse to the land. Do not create your own entity. Do not rebel against any nations. You must be loyal to the country that you reside in”. The Jewish people accepted this and they never wanted to have a state. Zionism came along one hundred years ago, a transformation from religion into nationalism. This movement was created by Jews who left the folds of the Torah. Theodore Hertzl [founder of Zionism], who did not want to abide by the rules of the Torah, by God’s rules, said “we have our own physical protection and we will go into a land and take it over”; therefore they decided to go and create the state of “Israel”. Clearly all the rabbinical authorities were opposed to this. It would be forbidden for us to have a State, even if it would be in a land that is desolate and uninhabited. It compounds the sin and the terrible crime because it was the in the inhabited land of the Palestinians. 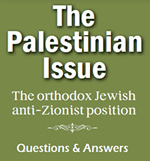 Now, they were afraid that people were going to oppose them because it is a terrible evil philosophy and ideology, this ideology of Zionism, so they waived the Bible and said, “You who are God-fearing know that this [the Zionist philosophy] is God’s word.” Therefore, people, unfortunately, today say that “maybe God’s word is bad” (G-d forbid) or that the Torah has been changed, or things like that. Know that God is compassionate. The Torah is totally true. There’s not one iota of the Torah that is not totally compassionate. We must try to understand God’s ways. We cannot comprehend everything of God, but everything of God is pure and compassionate. The Jews remain loyal to that Torah. Zionism turned away from that, created a state, rebelled against God, repressed the people. To intimidate the people they said that “we will create a state and you cannot question us because of the Bible.” They wanted religious people not to come in. I have full documentation that, because of time constraint, I cannot present now, but this documentation shows that they had collaborated with the Nazis; and they thwarted the efforts to save the Jews; they said “Orthodox Jews we do not want, let them die”; and it is documented that they aided and abetted the death of Jews and they thwarted the efforts of Jews being saved. This is what the Zionists did. There should be Nuremburg trials on the actions of the Zionists. Not only that, but the irony is, they said “as more Jews die then we will get more land because the more the bloodshed, then the nations will feel guilty and the nations will give us land”. After World War II they went to the nations and said “you must give us land”. They were given the land. Therefore they use the word “holocaust” because they demand that, that is one of the reasons to give them land. And they are afraid that if you talk about the holocaust, you will be able to find the truth: that they are guilty just as the Nazis are. They collaborated with the Nazis, so therefore they said “you can not talk about it.” Here in Iran, thank God, Iran opened the story. Let the world know that they should not be embittered [against the jews]. You do not have to be embittered. Open your hearts, ask your questions. We also agree with you that the holocaust is being misused. Jews were killed, but they died to sanctify God’s name. Their souls went up in purity and they don’t want to be brought down now to rebel against God. I am here to speak the cry of the dead of the holocaust: “We do not want to be used, to be soiled, to rebel against God with our blood. We do not want the state of “Israel”. We don’t want that our blood should be used and tainted for the state of “Israel”, which is a steady rebellion against God. We want a speedy and peaceful dismantlement of the state. With God’s help let us all pray for that and let us work together that the world should rethink this rebellion against God and know that it is wrong and we should have a dismantlement of the state and a return to Palestinian rule so that we can live in harmony as we have for hundreds of years with the Muslims.